Harvey’s property was special to the Indians. They needed a place to perform their ceremonies, where it was quiet, where animals and nature were close, and where Indians were welcome. Harvey’s place fit the requirements. The Skull Valley Band of the Goshute Indians had established Harvey’s land as an official Indian worship site. Local Indians of several tribes set up a turtle lodge and held their sacred sweat ceremonies there. Harvey invited me repeatedly to attend a ceremony. Resisting what I didn’t understand, I politely put him off. One Saturday, though, I reluctantly agreed, admittedly nervous to attend. When I came home several hours later, the children found me exhausted, my hair sweaty and matted. I took a big drink and a shower, then flopped down on the couch. They begged me to tell them all about the Indians and their turtle lodge. I sighed wearily, then told them of my experience with the sweat ceremony. “Four Indians officiated, with Harvey and some friends. Outside the lodge, Harvey had a bonfire roaring, with big rocks in the fire. The weather was very cold, as you know, with snow on the ground, but all the men changed into only shorts, and the women changed into shorts and t-shirts or loose house dresses. We huddled around the fire to keep warm while the Indians went into the lodge for a private ceremony. Harvey kept the fire hot. But the fire wasn’t for us—it was for the rocks. “At the entrance to the turtle lodge was an altar—a low mound of earth with sacred Indian things placed upon it. Harvey encouraged us all to leave an offering on the altar. Most left packages of tobacco for the peace pipe. Harvey gave me some tobacco to leave on the altar, since I had not known to bring anything. Then it was our turn to enter. I left my wedding ring and glasses on the altar—it was a place for safe keeping as well as for gifts. I explained to them that the lodge was made of flexible poles curving upward, each end anchored in the ground. A circle of these poles formed the lodge’s round, bowl-like shape, like a turtle shell. Smaller sticks rounded the poles, tied down where they crossed. Canvas tarps draped over the lodge’s shell, one on top of the other, until no light seeped in. A pit about two feet deep sat in the center of the lodge. The pit would hold the hot rocks. “We all sat around the pit, with our backs against the lodge walls, full of anticipation about the ceremony that was about to take place. One by one, Harvey carried several heavy, orange-glowing rocks on the tongs of a long pitch fork, placing them carefully in the lodge’s pit. Then the door flap was closed and pulled tight. The lodge became completely black, and quickly grew very hot. “The chief explained that all people are their brothers and sisters, and so we were welcome to worship with them so long as we respected the ceremony and everyone participating in it. The ceremony would consist of four parts, he explained, each about one hour long, where they would offer prayers and songs. In the first hour, we would seek the Creator’s blessings for ourselves, because we cannot bless others if we are not whole ourselves. The second hour would seek strength and protection for our families. The third hour would focus on the world’s children, on their purity and innocence, but also on their need for special protection. In the last hour, we would pray for our communities, and for the world. “The chief instructed us not to leave the lodge. If necessary, we could leave the lodge between hours. “He would give us water, he said, between hours because we were not accustomed to the rigors of the ceremony. We all felt a little worried, but the chief seemed to be a nice man. “The chief began the sweat, as Harvey called it, by singing an Indian song. The other Indians immediately joined him. I couldn’t understand a word they sang, but their language and music were compelling, a blend of beauty and mystery. I picked up the melody and hummed with them—as we were encouraged to do. The song ended suddenly. “One of the other Indians was tall and thin with long, straight black hair. He was blind and had facial abnormalities that made it difficult to speak clearly. But we could understand him. All the Indians spoke and prayed. But this Indian seemed particularly in tune with earth and sky that was home to himself and to generations of his ancestors. He was also very sensitive to our ignorance of their beliefs, and explained things openly, honestly, and without suspicion or resentment of us, the descendants of white men than had driven his people from their native lands, that had destroyed the fabric of tribe and community and family. I could tell he was a good man, an honorable man, and I liked him. “I saw scars on each Indian’s chest. I knew of the Sun Dance and the painful injury that left those scars. I asked the blind Indian if he would tell us more. By their silent reactions, I quickly gathered that I had asked about something sacred. But he could tell I was sincerely interested, so he explained. “‘Thank you,’ I said to him, quietly, with respect and humility. What courage! These were not just scars on his chest, but emblems of his yearning to touch his Creator, the supreme being of the universe, emblems that would always be there to remind him of who he was and of what his life was about. I told them how January’s frigid air had provided welcome relief from the intense heat, which the chief explained was between 120 and 130 degrees F. We sipped gratefully from the water he dipped and passed to us. The cooled air was blissful, and I sat with a smile until Harvey brought a new bunch of glowing boulders and the darkness shrouded us again. “As we sang and prayed and talked, and sat in silence, my back and neck and buttocks began to ache. The third hour was more difficult. I reached up and pulled on the poles to stretch and straighten my spine. The heat sapped my strength. There was enough room in the lodge that I managed to lie down, curled up on my side, while the others in turn sang and prayed and spoke and sat in silence. I was suffering, but I was still aware of what was going on and ready to participate when it was my turn. “Silence pervaded for several minutes while the blind Indian’s words lingered in the hot, dark air, and in our minds, while sweat ran from every pore. We listened to the silence, which was not empty, but rather full of energy and vibrancy, full of spirit and heart and soul, full of ripe intention. “Despite my discomfort, I began to notice within me an increasing comprehension of what was happening in the ceremony, in the turtle lodge. We had entered a place of total darkness and deprivation. To many religious people, this might seem a dismal thing to do. But not to them. These Indians had found a way to leave the earth, to leave their physical, mortal state, by entering a place from which all worldly elements were left outside: light, wind, water, air, food, clothing, pride, luxury. In this place existed only themselves and their Creator, with nothing in between. As I finished my long narrative, the children watched me quietly, in their own awe, unable to comment or ask questions. I knew that they hadn’t understood everything I had said, but I hoped that they had felt the bigness of my experience, that it was somehow sacred and important to them, as it had been sacred and important to me. They sensed that speaking would break the magic of the silence, would chase away the wonder and mystery of the images filling their minds. They could almost see the people in shorts and jumpers surrounding the rock pit, see the orange rocks placed one by one in the pit, see the canvas flap pulled tight, see the darkness. They could almost feel the unbearable heat, the hot sweat trickling down every wrinkle, dripping off our noses and chins and eyebrows. They didn’t hear the songs with their ears, but still the songs filled them and moved within them, feeling strange yet wonderful and satisfying. The feather was an eagle feather, I explained, which is a symbol of the great God, who lives high in the heavens, as the eagle, the greatest of birds, soars high in the sky. “The chief filled the pipe with red birch bark, lighted it, and puffed at the pipe. He then softly blew the smoke upward: an offering to God, ascending through the air to the heavens. What I had only seen in movies and read about in books had become a reality. I had smoked the peace pipe! I realized that smoking had nothing to do with it. It was all about the offering, an offering taken from the bark of the red birch tree, burning, drawn into me, mixing with my breath, with a part of me, as I sent it heavenward. “That was special,” I told them. I reclined on the couch looking at the ceiling. Then I looked at the children with a tired smile, and they knew I was done telling my story. Erin brought me another glass of water and some fruit—two oranges and an apple. Lying in bed later, my mind filled with visions of rocks glowing orange in the darkness, of Indian songs, of the smoke from the pipe, and of the Sun Dance. I wondered about my emblems, about my efforts to see beyond what I could see with my eyes, about my attempts to feel more than what I could feel with my hands. Thank you Roger. As I read the story I could hear the voices, feel the heat of the rocks, and smell the various aromas. What a marvelous, sacred experience. You are a genius with a special gift for telling it as it is..The hour is very late now but I will add more to this asap.. Yes how I miss those times..As I have shared with others my thoughts and experiences about the “Inipi” (sweat lodge) ceremonies they have proved to me to be some of the most spiritual and fulfilling experiences I have ever had. I cherished each and every one. After I left Erda I kept up with the Inipi’s at each area I lived in. I didn’t think I would get as much out of the ceremonies that never had my good friends sweat chiefs officiating, but most were right up to par with the ones that I had attended there at my home. Many amazing and wonderful things can happen there when we come in a “good way” and have pretty much prepared ourselves for a good experience. I pretty much had myself talked into a Sun Dance “piercing” Ceremony, but had to leave before I was able to see if I could get accepted. You did a great job of covering so many of the details. I am very grateful to you for what you are doing with your talent. I have been so very blessed to having been able to fulfill so many of my dreams throughout my life. Heavenly Father has indeed been very kind to me. I often wonder if I will get any kind of a reward from Him when I leave this life …because I have received so many here in this lifetime. I just hope that I can finish out what time I have left in a good way and don’t end up blowing it! “I read your Indian story and found it interesting. Harvey’s my good friend and always knew he travels to the beat of a different Tom Tom. It was enlightening to realize they don’t worship the Sun, but is a symbol. Fasting is symbolic of seeking the Spirit. “I have been friends with Harvey for years and used to help him harvest his mink. One year he had a coyote that he caught as a pup and he raised it in a wire cage. He never did settle down and when you walked by its cage it would be bouncing off the walls. Harvey knew its prime pelt would bring top dollar at the Washington State fur sale, so one day he told me to step into its cage and when the dog lunged at my throat Harv would grab him from behind and break his neck. I said hold it Harv, you have got to make me a better deal. 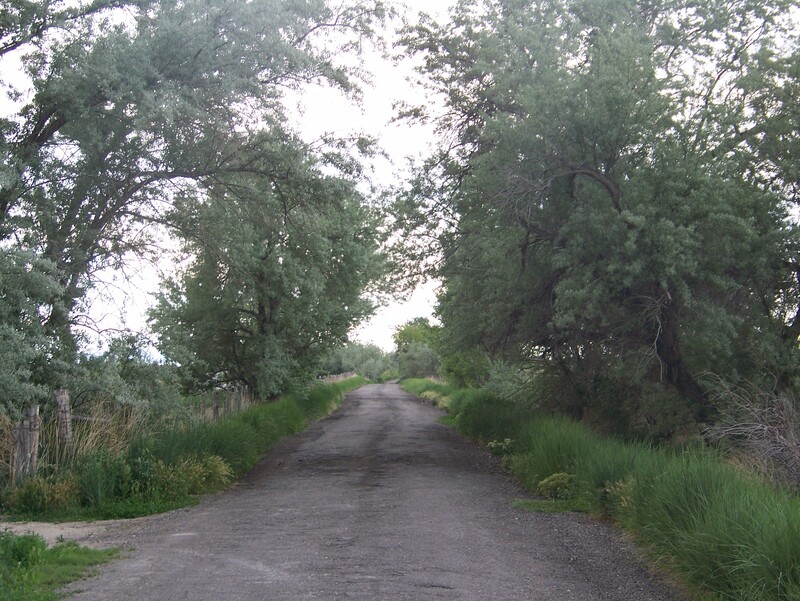 “There was a softball park just South of your Cottonwood Trees and when the games got over people would race back to Tooele past Harveys’ place, threatening their dogs and other animals. “During one game Harv and Jim Russell took their pick and shovel and removed a two foot wide section of asphalt the full width of the road out, and the sat in their lawn chairs to see what would happen. The first car out of the parking lot hit the trench so hard that all four hubcaps went flying. The rest slowed down. “Harv said how can we slow them down, and George said “`I don’t know, but you can’t do that,'” and drove off.